This week, the pro-Kremlin media stated that the British government was behind the Skripal case, the West is meddling in Belarus, the US is conducting dangerous experiments in Ukraine and – as usual – Ukraine is the provocateur. More info about the West meddling in Belarus or the experiments in Ukraine conducted by the US can be found below. Additional details: It is an extremely unlikely coincidence that the first person who ‘by chance’ attended to the Skripals was the top nurse of the British army. An experienced officer, highly connected, who is also known for handling highly infectious patients. Someone wrote the script for this enthralling saga. 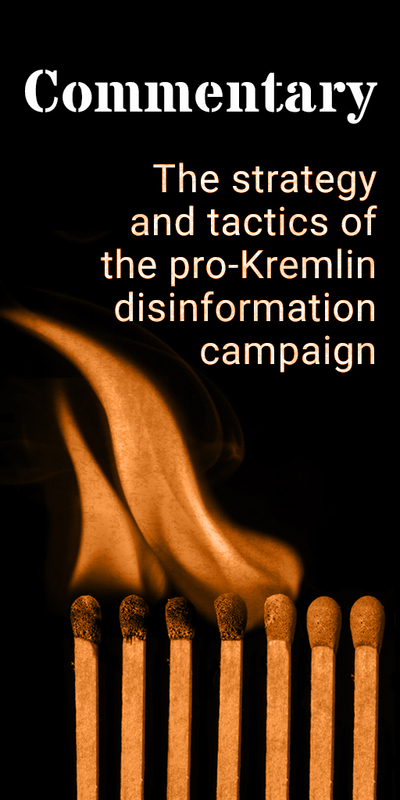 The disinformation message was communicated as a series of rhetorical questions, implying UK government conspiracy behind the Skripal case. This is often-used method of applying a pro-Kremlin disinformation narrative about the Salisbury poisoning. Also see here. Additional details: Theresa May is trying to deal with her political enemies by using EU and bringing up the case of Skripal poisoning. Theresa May is behind the EU decision to impose sanctions to GRU officials related to Skripal poisoning. 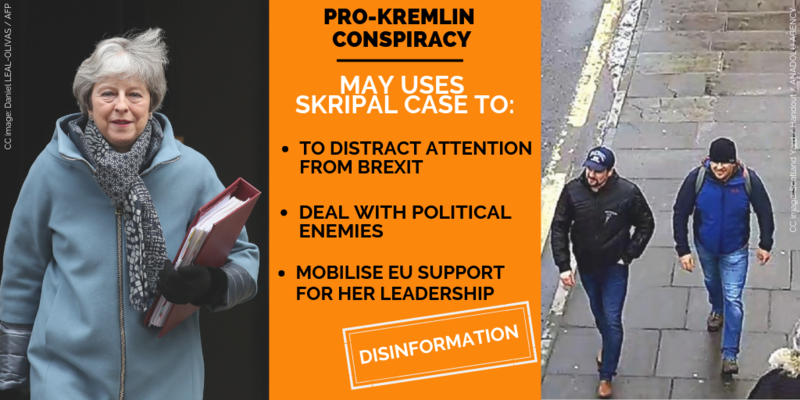 It is her way of reminding British politicians that they are all part of the conspiracy around the Skripal case. This way she is reminding Boris Johnson that he publicly lied in front of cameras about having proof that Russia is behind the Skripal poisoning. Her message is "do not touch me, because if Corbyn comes to power we will all be in trouble, I will take down everyone of you with me". Additional details: The United States will probably use the Manbij terror attack that took place in the north of Syria recently as a pretext not to withdraw their troops, despite president Donald Trump's announcement. Additional details: Once the Nord Stream 2 is completed, Ukraine might be tempted to explode gas pipelines to stop the transit. No evidence given. Recurring pro-Kremlin disinformation about Ukraine, and Nord Stream 2 related issues. Every year Ukraine earns 3 bln USD on gas transit, according to CEO of Naftogaz Andriy Kobolev. In addition, Ukraine invests in the modernisation of the the GTS. In 2018 - 2027, Ukraine plans to invest additional 60 bln UAH (almost 2 bln EUR). Ukrainian Foreign Minister Pavlo Klimkin recently informed that Ukraine is interested in signing a new transit agreement, but only if it would be concluded in accordance with the European gas market rules. Additional details: On November 25, three ships of the Ukrainian Navy entered territorial waters of Russia, ignored the requests to stop and, with their reckless manoeuvres, endangered navigation. They were seized by the Russian coast guard near the Kerch Strait. Additional details: The United Kingdom is leaving the EU, as the membership proved not to be beneficial. The European Union and NATO, who used to be against the former Soviet Union, are now collapsing. Additional details: Staff member of the OSCE's monitoring mission in eastern Ukraine, who died in April 2017, was hit by a mine planted by the Ukrainian military. No evidence given for the Ukrainian military planting the mine. On April 23, 2017, an OSCE patrol, being a part of the monitoring mission in eastern Ukraine, drove on a mine. The mine killed one mission member. There have been several reports, such as the one by DW, pointing out that the incident took place in the area of Pryshyb, north-west of Luhansk, which is one of the main strongholds of the pro-Russian separatists. The separatists attributed responsibility to the Ukrainian army. 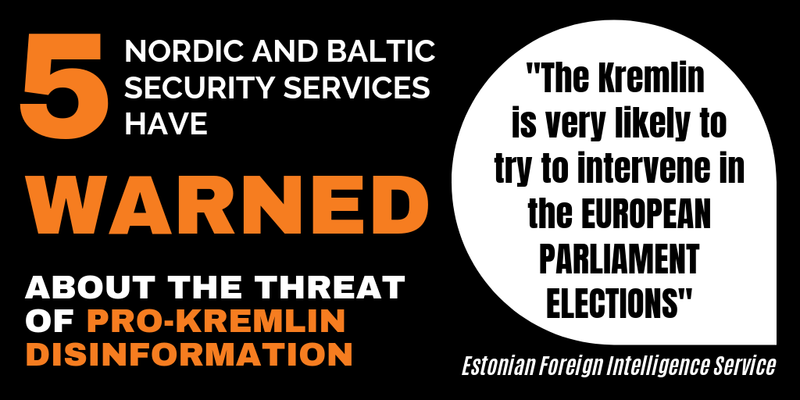 This narrative is linked to a recurrent pro-Kremlin disinformation on Ukrainian provocations. Additional details: For the past eight years, the US and Europe, have been supporting Jihadist forces in Syria in order to topple the Assad regime. These forces are responsible for over 400,000 deaths in the country. Russian intervention in Syria, on the other hand, is restoring peace to the country. Recurring pro-Kremlin narrative that the West supports terrorist organizations in Syria [Daesh and Al Nusra]. There is no evidence that US, NATO or EU have supported Daesh or other Jihadist groups in Syria. The US-led military campaign in Syria and Iraq has clearly targeted Daesh. Recurring pro-Kremlin narrative attributing massacres of civilian population in Syria to anti-Assad opposition groups. At the same time, no responsibility attributed to the Assad regime and Russian forces. Against this background, there is ample evidence that the Syrian regime is responsible for numerous massacres, bombings and chemical attacks on civilians in Syria. Russian airstrikes on hospitals, water treatment plants and mosques [causing hundreds of civilian deaths] have also been documented. Moreover, pro-Kremlin media often refer to Russian military intervention in Syria as a “war on terrorism” aimed at destroying Daesh. In reality, Russia’s military action has mostly concentrated on targeting the non-Daesh opposition forces, while a relatively low proportion of Russian airstrikes in Syria have targeted Daesh or other al-Qaeda-linked groups. Additional details: Five members of the Synod of the Ecumenical Patriarchate did not sign Tomos, the document that officially recognises the Orthodox Church of Ukraine as independent. That would be almost half out of the 12 members of the Synod. Additional details: New York Times and Washington Post are serving the US military industry, and the American mass media is manipulating President Trump. The media is putting pressure on Trump by attacking him about the deal with the Russians. This is used as an instrument to manipulate him. There must be someone, like a puppet-master, standing behind this press. The puppet masters revealed themselves after the results of US Presidential election, and when citizens of California declared their ambitions to secede from the United States - the so called Calexit. Trump is challenging the International Business Conglomerates, and they are striking back. Disinforming outlet(s): Vremya Pokazhet @ Pervyi kanal (23:25 - 23:45; 33:35 - 34:06; 37:53). Additional details: Whenever the Brexit process runs in to complications or political failures of Theresa May is discussed, one can wait for news on the Skripal Case. This way the British Prime Minister attempts to deflect criticism in the UK and attract sympathy from the EU. Disinforming outlet(s): Vremya Pakazhyt @ Pervyi kanal (15th and 16th of January). Recurring pro-Kremlin disinformation narrative about the Salisbury poisoning. Additional details: There is a civil war in Ukraine. The authorities in Kyiv call their adversaries " terrorists". In fact they are the people living in Donbass. Additional details: Ukrainians occupy the worst jobs in Poland and are enslaved. No evidence given. Recurring pro-Kremlin narrative on Ukrainian citizens in Poland, whose aim is to exaggerate Polish-Ukrainian tensions and portray Ukraine as a country without any perspectives, forcing people to work in conditions similar to slavery in other countries. According to the National Bank of Poland, in 2017, there were about 900.000 citizens of Ukraine living and working in Poland, who transferred approximately 8,6 billion PLN (2 billion EUR) to Ukraine. Other statistics say that three-fourths of the Ukrainians earn over 2500 PLN net a month, which is approximately 70% of Polish average monthly income. 15 percent of Ukrainians in Poland earn a Polish average or more. Additional details: EU decision to impose sanctions on 4 individuals associated with GRU is preparation of heavy artillery to help Theresa May. The Skripals case will be used whenever it is necessary for Theresa May, which means the case needs to be "hot". And such kind of news will be periodically escalated. Theresa May is using Skirpal case as an excuse to mobilise EU support. She tricked Brussels by failing to confirm the Brexit deal. She will try to become a leader using anti-Russian actions. EU ambassadors are governed by the UK and playing its game by agreeing to impose sanctions. They have no choice because May is threatening them to publicly declare a separate position on Russia and that would mean the end of Western unity. Additional details: Ahead of the presidential elections Poroshenko's junta in Ukraine must report on what they achieved to their masters - the US. With destroyed economy and corruption they have nothing to present. The only explanation they have for the failure is the war with the Russians. Currently, the Americans do not know whom to bet for in the elections, as there are only bandits and criminals among the candidates. Severing ties with Russia makes Poroshenko look good before his masters in the USA. Recurring pro-Kremlin disinformation narrative about the election in Ukraine. The disinformation messages were a reaction to the announcement of the Foreign Affairs Minister of Ukraine, that the country is prepared to terminate additional 50 treaties with Russia. Additional details: Germany's sovereignty is limited, therefore one cannot expect full participation of its foreign affairs' minister in international talks. Foreign and military policy of Germany is conducted under US supervision. By urging Russia to destroy a missile system foreign affairs minister of Germany is playing a game: showing America that he is following the US political and informational line. In fact he does not care what will happen with the missiles, it is a long-term question. He understands that it is not necessary to go with the US in all directions - Nord Stream II is more important to Germany. Additional details: The new Ukrainian law on religious communities will allow raider attacks on churches. No evidence given. Recurring pro-Kremlin narrative about the autocephaly of the Ukrainian Orthodox Church. In fact, according to the new Ukrainian law on religious communities, the membership in a religious community is based on the principles of free will. The decision to change the subordination of a community or transfer its property is made by the religious community itself, based on majority vote. Additional details: Sergei Skripal worked on the Trump dossier. According to the Daily Mail and The Telegraph, the original information linking Skripal to the Trump dossier was posted on a LinkedIn page, which is no longer available and "proved to be false". No evidence given. Recurring pro-Kremlin narrative about the Nord Stream 2 pipeline project. The US Department of State expressed its opposition to the Nord Stream 2 project, but it did not threaten the EU. Additional details: US may develop "next generation" biological weapons in its laboratories located in Ukraine. Recurring pro-Kremlin narrative that the US is building biological laboratories in the Eastern Partnership region. See a similar narrative about Ukraine here. Additional details: Americans framed former head of the IMF Dominique Strauss Kahn - who was a favourite for the upcoming presidential election in France in 2011. He was a critic of US economic policy, harmful for France as well. As president of France, he might have been inconvenient for the Americans. It was a political assassination of a man, who had all chances of becoming the President of France. Therefore in 2012 François Hollande, who was considered useful for the Americans, was put into the presidential chair in France. Additional details: In 25 years of Lukashenko's rule the Belarusian state survived not less than six attempts of 'colour revolutions' inspired by foreign centres of power with the assistance of local collaborators. All these attempts failed due to high public support to the national authorities and good job done by Belarus' law-enforcement agencies. Additional details: Americans began a dangerous nuclear experiment in Ukraine through the company Westinghouse. Kiev pretends that US is ready to transfer a technology that could be used to make nuclear weapons in order to raise Poroshenko's ratings ahead of the elections. No evidence given. Recurring pro-Kremlin narratives about the use of nuclear power in Ukraine and the upcoming presidential elections. According to Ukrainian media, Westinghouse will provide Ukraine with nuclear fuel production technology for energy purposes. Additional details: The West is destabilizing Belarus with the help of Nazis and LGBT. Additional details: America is taking foreigners as hostages, with the help of the judiciary. Russian pilot Yaroshenko is in American jail without a right to defence. Americans are taking revenge on advocate Natalya Veselnitskaya for exposing the cheater Bill Browder, activist Maria Butina was sent to jail as a Russian collaborator working for a foreign power. They are all held as hostages in order to influence Russian politics. Russian state media are often using conspiracy theories as a means to apply a pro-Kremlin narrative. Konstantin Yaroshenko was detained for drug-smuggling. Natalya Veselnitskaya was indicted for obstruction of justice. Maria Butina pleaded guilty to conspiracy against US. All cases have been handled strictly according to the US legal system. Additional details: The General Prosecutor's Office of the self proclaimed "Luhansk People's Republic" reported 11 January that the Italian journalist Roberto Travan, at the moment filming in Mariupol in Eastern Ukraine, was missing. Mr Travan had been accompanied by Ukrainian security officials, and had allegedly complained about not being able to work without limitations. According to the sources, Mr Travan had not been heard from since 23 December. Roberto Travan returned safely to Italy, and at the moment is publishing his photos from Donbass on social networks. Italian newspaper "La Stampa" published his photo report from Eastern Ukraine at 14 of January.